Throughout the whole period lasting from November 10, 2012 to March 10 of next year, a collection of art works from Damian Hirst's private collection, Freedom not Genius, will be on view in the former Fiat car factory, Lingotto, in Turin; the architect Renco Piano has transformed the one-time industrial space into the home of the contemporary art gallery/fund, Pinacoteca Giovanni e Marella Agnelli. Hirst is definitely one of the art market's largest magnets for critique, and his Spot Paintings – dispersed around the globe – often evoke the same feelings that many have for corns on their feet. Nevertheless, he is undeniably one of the most talented businessmen in today's market. It is not for naught that Gregor Muir wrote in his book, Lucky Kunst: The Rise and Fall of Young British Art, that if Hirst hadn't gone into art, he would surely have been the best plumber in Leeds. Back in the late eighties, when still a student at Goldsmiths College, the young Damien Hirst began assembling an art collection by trading his works for those of other students. Today, this collection contains works by more than a couple of artists who's names have become standards in the contemporary art world. The works of more than fifty artists make up the Turin gallery's exhibition, in which alongside works by Jeff Koons, Bansky, Tracey Emin, Sarah Lucas and other present-day artists, have been placed creations by Frank Auerbach, Francis Bacon, Alberto Giacometti, Bruce Nauman, Richard Prince and Andy Warhol. Since 1958, Sotheby's – currently one of the largest auction houses – has garnered world-wide attention with its impressionism- and modern art-evening auctions. This autumn, that evening will be November 5, which will see the sale of select works by Pablo Picasso: nine works in total, illustrating Picasso's relationships with his muses in their various periods. The evening's most valued lot is believed to be Picasso's 1932 painting, Nature morte aux tulips, which features the love-of-his-life, Marie-Thérèsa Walter. Picasso and Marie-Thérèsa met in the winter of 1927, when the artist, having seen his future muse for the first time, invited her to become his model. At the time, Marie-Thérèsa was only 17, while Picasso was 46. According to art experts, this mysterious woman's profile can be seen in several of Picasso's pieces that were created before he met Marie-Thérèsa, leading to the speculation that when Picasso first laid eyes on her, he must have thought that he was seeing his fantasy come to life. The selling price of Nature morte aux tulips is estimated to be anywhere from 35 to 50 million US dollars. But on November 7, followers of the art market will turn their attention to Christie's auction house, where the evening auction will feature works by Juan Miró, Alberto Giacometti, Edgar Degas and George Braque, among others. The title role of the evening, however, must go to Claude Monet's water lilies. The 1905 painting, Nymphéas, reflects the poetic atmosphere of Monet's much-loved garden at Giverny; unlike in the artist's early works, here the horizon line disappears, and the image takes on an almost-abstract form. 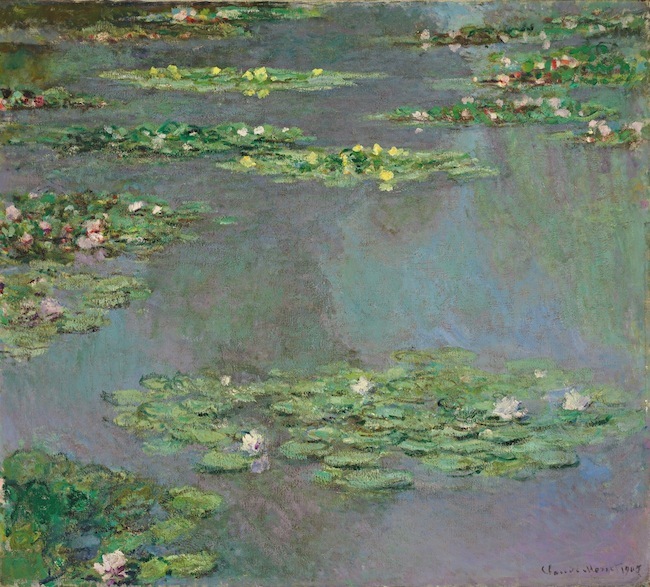 Although this is only a part of the series that has now become symbolic of the world-famous artist's works, every one of his pieces that depict the water lily motif – with their changing seasons and lighting – stands alone as an individual character with its own unique personality. Nymphéas is making an extremely rare appearance on the art market stage, and collectors are not hiding their interest; its price at auction is predicted to end up in the range of 30 to 50 million US dollars. Another worthwhile mention goes to Wassily Kandinsky's 1909 masterpiece, Studie für Improvization 8, which represents one of the artist's most critical creative periods (from 1909 to 1914), at which time Kandinsky's creative searching took on an ever-increasingly abstract form. Studie für Improvization 8 gives insight on the starting point for this search-process, and is also one of the largest and most saturated parts of the improvisational series. The painting's selling price is forecast to possibly reach the 20 to 30 million US dollar mark, and to likely surpass the current 1990 auction record for a piece by Kandinsky – 20.9 million US dollars. Every autumn, the international art market database, Artprice, releases a compact summary of the year's price fluctuations for the most visible artists, as well as an overview of the latest changes in collectors' tastes, and how individual decisions made by art market participants have influenced the development of contemporary art. Encompassing the period from July 1, 2011 to September 30, 2012, there is only one conclusion to be had – the global contemporary art market is continuing to grow at an accelerated pace, and new records are consistently being set. According to Artprice representatives, new records and sharp price increases – surpassing the previous year's statistics by several millions – were observed in almost every international contemporary art auction. Special prominence has been achieved by the photographic art-segment of auctions, which has seen a particularly swift rise in interest from collectors. Although the current record for the most expensive photograph to be sold at auction is Andreas Gursky's Rhein II – which sold for 2.7 million British pounds in January 2011 – it is likely to be beaten in the near future by one of Cindy Sherman's pieces. 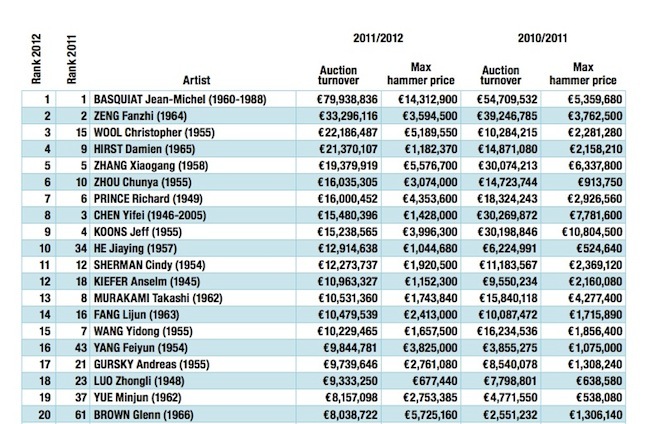 The most highly-valued artists (born after 1945) in Europe's auction houses this past year were Jean-Michel Basquiat, Jeff Koons, Christopher Wool, Glen Brown and Antony Gormley. A more detailed look at their works and corresponding prices can be found in Artprice's summary. In total, approximately 41 thousand pieces of contemporary art were sold, globally, in the last year; this is four times more than were sold at the beginning of the year 2000. And the net return for last year (excluding auction house commissions) is estimated to be 915 million euros. However, it should be taken into account that the contemporary art market is becoming ever-more international with every consecutive year, and that last year, 43 percent of contemporary art sales took place in Chinese auction houses, followed by 30 percent in Europe, and 26 percent in the USA.